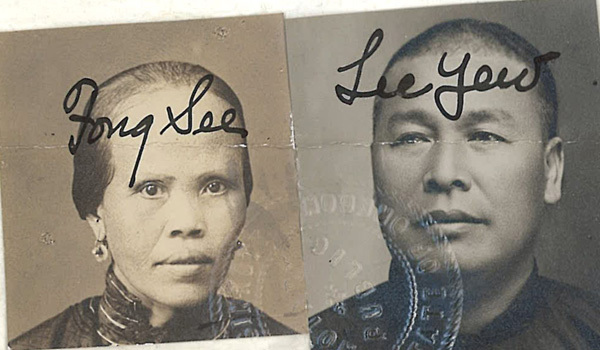 “Heung Shee, Jay Boo Yum, Jay Yu Nom family portrait” 1894, Chinese Exclusion Act case files, RG 85, National Archives-Seattle, Jay Boo Yum case file, Portland Box 7,file 1900. Jay Boo Yum, born in Portland, Oregon in 1892 was the son of Jay Yu Chong, a well-known jeweler and a member of Fook Sang & Company. Jay Yu Chong, also known as Jay Yu Nom, was born in China and first entered the U.S. at San Francisco in 1877. Three Caucasian witnesses testified in their behalf– Gus Rosenblatt, M. Billings, and Dr. S. Lewis King when Jay Yu Chong and family left for China in 1894. Jay Yu Chong had two wives—one in China and one in Portland. He married Heung Shee in San Francisco in 1890. They moved to Portland shortly after they were married. 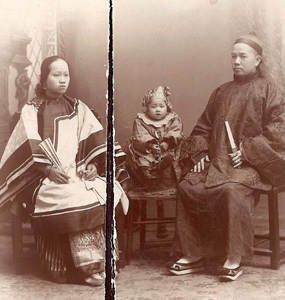 In 1894 Jay Yu Chong applied to visit China with Jay Heung Shee, his 2nd wife, and their two-year old son, Jay Boo Yum. They were going to his home village of Don Jo, in the Nom Hoy district. His first wife, Fung Shee, was living there with her two sons by Jay Yu Chong. Jay Boo Yum was sick when his parents returned to Portland in 1895 so stayed in China with his extended family. They all lived within a few houses of each other in the center of the village called Gook Tong Fong. Jay Yu Chong regularly sent support money to them. By 1909 Jay Yu Chong and his 2nd wife had seven children, all born in Portland; five were living. They made a trip to China in 1909 to bring back Jay Boo Yum, their oldest son. Immigration Inspector Barbour interviewed the same three witnesses who had been interviewed in 1894. Gus Rosenblatt swore that he had known Jay Yee Chung for 25 years and took friends to Fook Sang & Company to see the Chinese jewelry. M. Billings who had fire insurance business swore that he had known Jay Yu Chong since around 1890 and S. Lewis King, a physician and surgeon, swore that he delivered Jay Yu Chung’s son, Jay Boo Yum, in 1892. Jay Yu Chong presented Jay Boo Yum’s Oregon birth certificate for inspection and it was returned to the family. A copy is not in the file. There were a few discrepancies in the statements taken by Commissioner of Immigration Ellis DeBruler that needed to be cleared up. The applicant stated that his father had one wife but Jay Yu Chong had two wives. Jay Yu Chong explained that his son thought if he said his father had two wives his father may not have been able to enter the country. Jay Boo Chong also thought his father and his second wife only had three children instead of five. He had not been informed about the births of the last two children. J. H. Barbour, Immigration Inspector in Charge, did not think the discrepancies were important enough to exclude Jay Boo Yum because all the other paper work was valid. Jay Boo Yum was admitted to the United States.